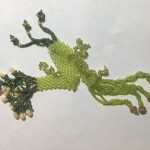 There are numerous fringing techniques that can be used to embellish beadweaving, quilting, knitting, crochet, wirework, embroidery and more. In this Explorations session, we will examine 8-10 different fringing techniques and think about how they can be used to add movement, dimension and transitions. During the class, you will have an opportunity to create a sampler of techniques for future reference. Materials for these exercises will be provided.